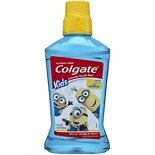 Shop Colgate Kids Minions Bello Anticavity Fluoride Mouthwash Bubble Fruit (16.9 oz. )16.9 oz. $429$4 and 29 cents$0.25 / oz. Shop Firefly Kids! 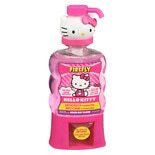 Hello Kitty Pump Mouthwash Melon Kiss (16 oz. )16 oz. $479$4 and 79 cents$0.30 / oz. 2 for 8 dollars and 00 cents or 1 for 4 dollars and 59 cents $4.59 $0.27 / oz. You want to introduce healthy dental hygiene habits to your children at an early age. You might have even washed your little one's gums long before those first baby teeth appeared. Once your child's teeth broke through, you likely used training toothpaste to get your toddler in the habit of brushing his or her teeth. Just as mouthwash is a beneficial product for your teeth, it offers advantages to your kid's teeth as well. Mouthwash can help eliminate plaque that toothbrushing might leave behind. Since your child probably isn't as skilled at effectively cleaning his or her teeth as you are, chances are some plaque might remain on or in between the teeth even after brushing. Mouthwash for kids is another layer of protection against cavity-causing plaque and buildup. Several styles of kids' mouthwashes are available at Walgreens, allowing you to improve even your youngest family member's dental hygiene routine with ease. Evaluate the benefits of these mouthwashes when deciding which one best suits your little one's pearly whites. Mouthwash for kids helps to protect even the youngest mouths, ensuring they stay healthy. Avoid unnecessary--not to mention unpopular--trips to the dentist with your kids by establishing a healthy dental hygiene routine at a young age. Mouthwash ensures that plaque and buildup are more thoroughly eliminated from your kid's teeth, thereby reducing the risk of cavities. Kid-friendly mouthwashes, available in several brands at Walgreens, are safe for even the youngest mouths. These mouthwashes come in a number of flavors that appeal to kids, including bubblegum and kiwi-watermelon. These products have kid-friendly labels that will encourage your youngster to use them. Simply have your child swish the mouthwash in his or her mouth for about 30 seconds and then rinse. Fluoride-based mouthwashes can help minimize the risk of cavities. 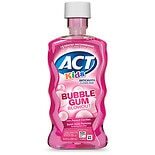 At the same time, these kids' mouthwashes can wash away particles that might remain in the mouth and on the teeth. Start your child on a path to healthy teeth by adding a mouthwash for kids to your child's daily routine. This healthy habit can benefit your child--and his or her smile--for years to come.